If you follow Dr Who then you will have noticed he got both a new TARDIS and a new Sonic screwdriver. ThinkGeek managed to get their hands on a some for sale. The item is described as being a collectors item and also as being “an exact replica of the Gallifreyan multipurpose tool used by The Doctor himself”. The new model is larger than the previous models and has a bright green light on the top along with a spring loaded extension. While the screwdriver is closed, just press the button on the side to activate the LED and sound effects. Flip open the cap on the end to reveal an additional button that will activate the light and sound effects when the screwdriver is extended and open. We’re not sure if you’ll be able to save the world, but at least you’ll look hip trying. 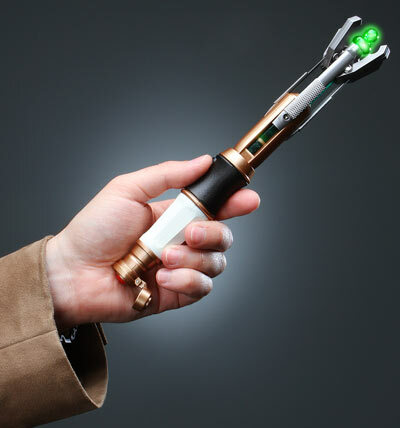 * Dual-wield sonic screwdrivers with the 10th Doctor’s sonic screwdriver – whoa. Available now for $25.99 at ThinkGeek.